Hiking brings about a thrill of adventure that is truly incomparable. Dogs make excellent hiking companions; their exuberance lifts your mood and, depending on the dog, their endurance can go on for quite some time. While you get your own gear ready for a day on the mountain trail, preparing for the canine hiker going with you is important. Among other things that should be on your checklist is a good harness for hiking. Safety – This is the most important thing to consider. You would never want to risk your beloved pet’s safety by using a harness that can cause injury. Review safety features like emergency release options, and also look for good weight distribution. Since you are using a harness, your dog’s neck should be relieved of the stress that collars can cause. A harness suitable for hiking should also have safety features like reflective trim that allows you to spot your dog in low-light conditions, bright colored materials that make it easy for you and other hikers to see him during the day, and extra leash rings for added control. Durability – A harness that is not durable can wear out quickly, especially if your dog is a strong puller. It also depends on how often you use the harness, and for what kind of activities. You must ensure the quality of the fabric and the stitching, as well as the sturdiness of the buckles and leash rings. If you are going on a hiking trip, then the ruggedness and durability of the harness becomes even more significant. Comfort – Much like the clothes we wear, comfort should be the top priority when choosing a harness. Some materials are soft and permit airflow, while others can easily get very uncomfortable along the skin. In addition, other considerations for comfort are padding, pressure distribution, and proper fitting. Since your dog cannot speak, it is your duty to ensure that the feel and overall fit of the harness are perfect. A harness that your dog wears for hiking has to check all these boxes, because he will be wearing it for a long time. Size and Adjustability – It is of the utmost importance that you measure your dog beforehand and order the correct size. Dogs vary largely in their build, so also check what options the harness has for custom adjustments. After purchase, adjust the harness properly to ensure a snug fit that is neither too tight nor loose enough to slip. An ill-fitting harness can cause great discomfort to your dog and can prevent your companion from enjoying the hike. Also, if a dog escapes from a loose-fitting harness on a trail, he can be in danger. Mobility – A good dog harness must allow your dog to walk and run around easily and not restrict movement in any way. This is also important because an ill-fitting harness that creates friction against the limbs can cause chaffing. 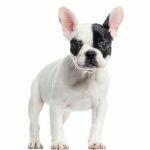 Apart from this, a feature that enables your dog to accompany you comfortably is a handle on the harness that you can use to guide him over obstacles. Here are the 5 harnesses that we found worth noting in our review of the best trail gear for dogs. 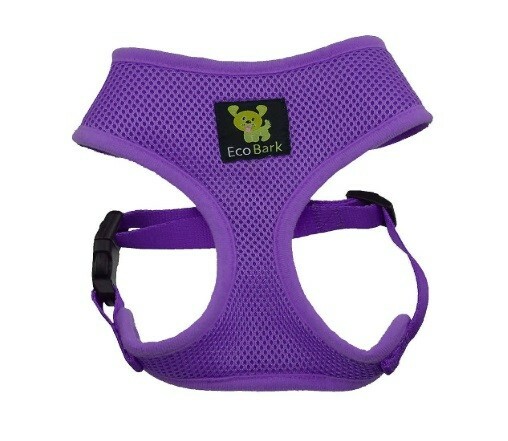 The ECOBARK Original is designed for dogs of small to medium size. It has soft padding and is made of mesh fabric that allows airflow in order to keep your dog comfortable. Hence, your dog will find it easy to wear for longer periods of time on trails. The harness is also light in weight, which means it is not a burden on the dog. The chest strap is adjustable, so you can customize it to fit snugly. The straps are produced using eco-friendly materials such as reused water bottles. This harness has a very wide range of color choices. As opposed to the ECOBARK, this harness is suitable for a big dog, particularly for barrel-chested ones. 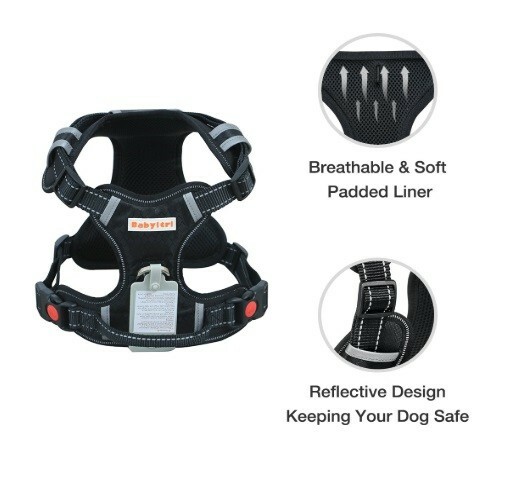 Usually, big dogs seem to have a hard time fitting into harnesses, but BABYLTRL has designed this product specially with large dogs in mind. In addition, adjustable neck and chest straps allow a custom fit. This harness has breathable padding and is also lightweight. As a result, dogs can wear it for a long time on hiking trips. Moreover, it has reflective strips, which allow you to see your dog clearly when it grows dark. The handle on the top allows you to guide your dog in tough areas and over obstacles when you are off-road. This harness comes stacked with a soft cushioning so that your pooch is comfortable during long walks and hikes. Adjustable at 3 points, it provides a good custom fit for your dog. The front and back durable metal D-rings give maximum control, while the handle on top allows you to assist your dog in difficult spots on the trail. With reflective straps to provide visibility in low-lit conditions, this harness becomes even more worth buying. This rather high-end and high-cost harness has padded chest and belly straps that allow great comfort while your pet joins you on long adventures. There are two aluminum leash rings reinforced with webbing, hence the connections are durable and secure. 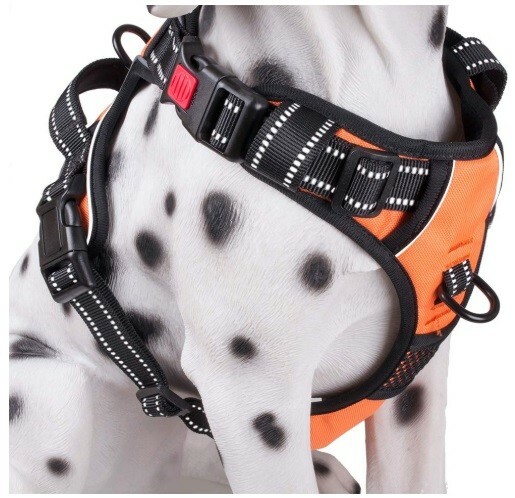 In order to ensure a perfect fit, the harness is adjustable at four points. The reflective trim on it allows you and your dog to stay outdoors during late hours without worrying about low visibility. 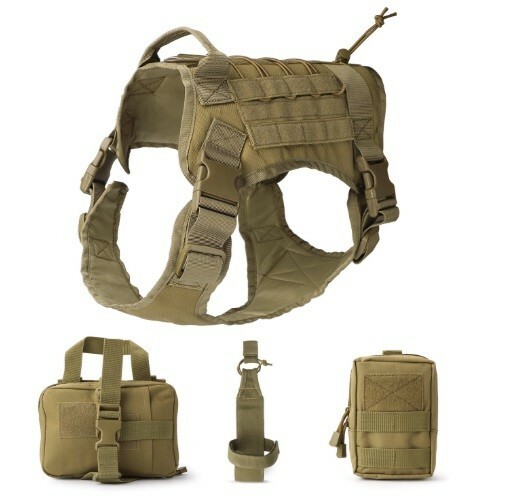 This harness includes a MOLLE system, which makes it very adaptable. MOLLE is a system for tactical gear that allows different load carrying options. With 2 MOLLE pouches, 3 MOLLE patches, and a water bottle holder, this vest makes your dog ready for any outdoor adventure. The vest itself has cushioning to guarantee your pooch’s comfort and safety. 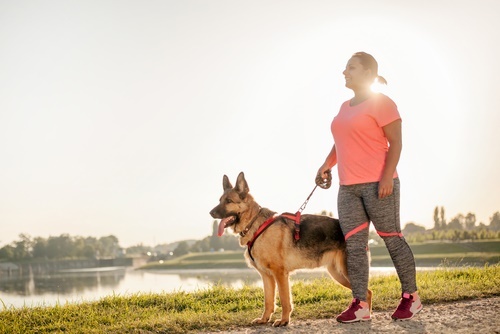 A metal V-ring connects to your dog’s leash, while a handle on the top allows you to guide and assist your dog on the trail. 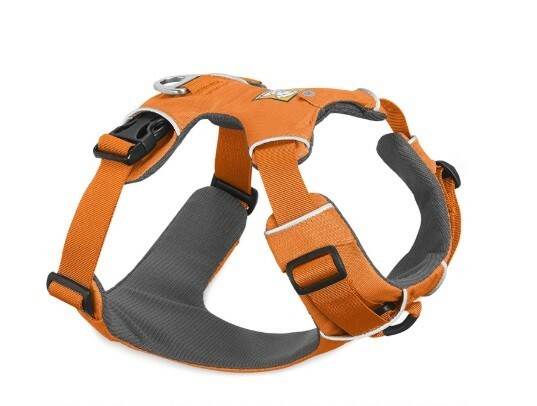 Although this harness will not fit small dogs, it still has adjustment options for dogs of different builds. While all dog owners are familiar with walks, hiking with your dog can be a completely different experience. There are several things you need to know, from making sure you know the rules of the trail to ensuring your dog is properly trained for the outdoors. 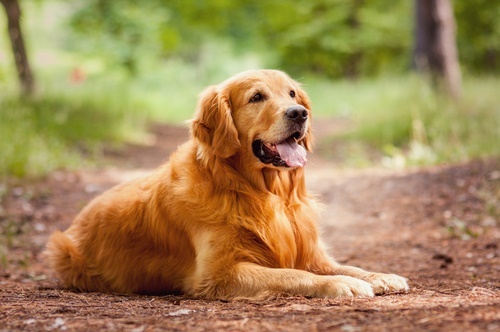 Following are some factors dog owners should keep in mind when hiking with their pet. Strict Voice Command: In order to ensure their pet’s safety, owners should make sure their dog will respond to orders promptly. Without this, hiking can be quite dangerous. If you trek across an area that is unfamiliar, then you never know what sort of animals or other hazards might come your way. For this reason, it is important that the dog does as you say immediately. Right-of-Way: When on a hiking trail, there may be other dog owners with their pets around as well, so it is important for you to make sure you and your pet yield the right-of-way, allowing others to pass and not obstructing the road for anyone else. Route: It is important for dog owners that go off-road with their pet to plan a route that their companion can easily cover. Make sure you are not putting too much stress on your canine friend. Minimum Impact: It is important to leave everything as it is, and not disturb the wildlife and landscape. If your dog needs to relieve himself, make sure you pick up after him. Hiking harnesses should be sturdy and must also be comfortable enough for your dog to wear for long periods of time. The purpose of this review is to give you an idea of what to get for your hiking partner’s safety on your next off-road adventure. If you want to combine the hiking trip with a bike ride, your dog can still accompany you. Find out what our choices are for the best pet bike trailers. As far as the day out on the trail is concerned, you can choose one of our recommended products from the list above or use this article as a guide to research other products. Happy hiking!